Fashionistas Daily .Com: Awesome Way To Get Rid Of Stinky Smell From Your Pets ! Awesome Way To Get Rid Of Stinky Smell From Your Pets ! Nothing more nasty than those unpleasant smells from your dogs or cats ( well sometimes boyfriends or husbands included..LOL ) so we've search up and lows and found these fabulous products that not only get rid of the nasty smells of your pets, but also creating the aromatic atmosphere that you can enjoy ! These fabulous human grade (means you can use it on yourself,too!!) solid perfume balm iss for both your precious pets or on yourself!! Made with all natural shea & aloe butters, a blend of botanical & essential oils, purified beeswax, grapeseed, sweet almond & apricot kernel oils, vitamins A, E& F! Aroma paws deodorizing dog coat spray is blended with green tea leaf extract for a shiny coat, aloe leaf extract to soothe skin, and sweet almond, coconut & olive oils to relieve dryness. The spray is a chemical free product, PH balanced! in Eco-Friendly, Bio Degradable bottle! Contains NO Dyes, Parabeans, Alchohol, Salt, Phosphates, Synthetic Fragrance! NO DEA, TEA, SLS, Pesticides or Animal by-products! It's made with all with natural ingredients! Ingredients: Purified water, glycerin, sweet almond oil, coconut oil, macadamia seed oil, green tea leaf extract, extracts of apple fruit, lime flower, beet root, aloe leaf, chamomile flower & Dandelion, olive oil & sorbitol surfactant, citric acid, blend of botanical & essential oils. Girls! Ever wonder if the yucky smell is from your pets or your husband/boyfriend? well... this Extreme yet elegant & all natural odor eliminating room candle will do the job like magic! 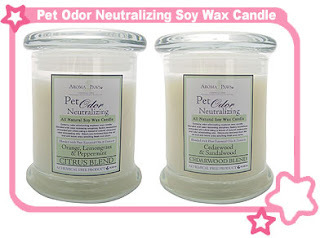 This elegant candle is blended with an odor neutralizing oil & enzymes along with botanical and essential oils to remove Pet Odors (Husband or Boyfriend) odors from the air and will leave area smelling fresh and clean. Big 12 oz designer glass bottle and available in choice of 2 scents: Citrus Blend (orange, lemongrass & peppermint) or Sandalwood & Cedarwood blend. That's all we have to report today, you can get some of these products at Luxe-Gifts.com. come back again to check out what other fabulous must have items we've find to share with ya!